Let’s. Do. The yurt. Move. Again. 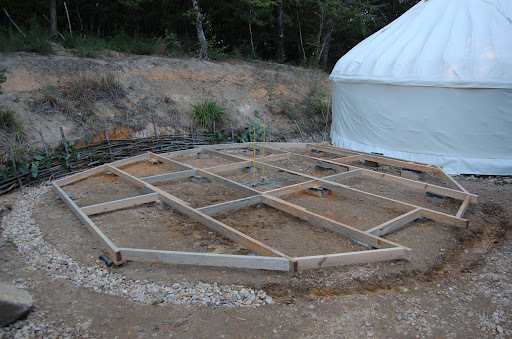 The yurt we’ve been living in since Autumn last year needed to make a jump to the left (or a step to the right). Here’s how you can do it at home. A bubbling sound and then… nothing. o I stalled the tractor while cutting some grass. o Before I re-started it, I thought I might as well check the oil level, which I’d never done. It read: “DANGEROUSLY LOW”. o I bought some oil. But not straight away. Which meant the tractor sat where it was for a while. o I added the oil. But I still didn’t start the tractor. Because one of the tyres has no thingymajig in the wotsit. Which means it needs pumping up once a month (to save the tyre becoming dangerously low, too). But I didn’t have a portable compresser to put the air in. And in an effort to save €50, I waited for my friend Claude (who does have one) to drop by. He didn’t drop by any time soon. So the tractor sat there for a while longer. o I bought a compressor and put air back into the tyre. o I tried to start the engine. There was a bubbling sound and then… nothing. Over the next year or so, I conferred with a number of people on what had probably happened. And the conclusion was: rain. You see, my tractor has a vertical exhaust pipe. It turns out this is a very good way of catching rain. And while the tractor had been sitting there all that time, it had rained quite a lot – as much as several inches, to be imprecise. When I tried to start the tractor, some kind of suction had drawn water into the engine, mortally wounding it. It might have survived if I’d contacted my friend Claude straight away. But I didn’t get him to look at the engine for about a year. By which time, it was a solidly ex-tractor. I felt terrible. The engine is a couple of years older than me. And it had died for want of an empty baked-bean tin (or equivalent) placed over the top of the exhaust. It is one of the most expensive mistakes I have ever made. So when I borrowed a tractor from a neighbour a few weeks ago, I was at pains to assure him that I would put something over the top of his equally vertical exhaust, in the event of rain. Bernard’s tractor is magnificent. Me and Ed (one of this year’s last and loveliest guests) loaded several tons of rocks into the bucket on the back, which can be emptied by pulling a handle. In one afternoon, we moved the equivalent of about 80 wheelbarrows of rock from one side of écovallée to the other, in preparation for the new road and parking area. But as I haven’t come close to making you aware, that wasn’t the only thing we’ve had to do recently. 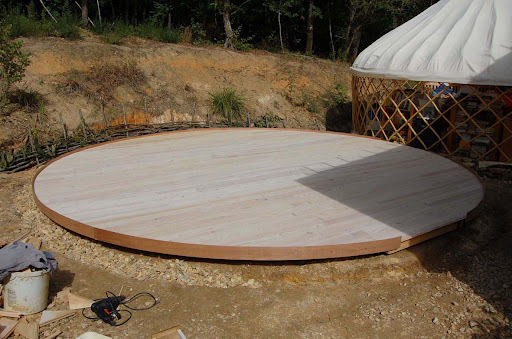 With the arrival of our two first (and equally lovely) HelpXers, our winter yurt platform leapt to the top of the list. 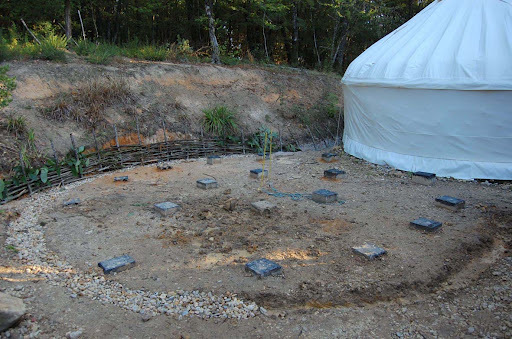 We cleared the site, dug away some hillside and put recovered concrete blocks into the ground, despite the rain (which was only really heavy one night). A couple of days ago, I woke up early in the morning. I wondered why I had woken up and then… panicked. Because despite my promises to Bernard – despite a very expensive and easily avoidable lesson – I hadn’t put anything over the exhaust of his tractor. I went down to the field, hoping that I had reversed the tractor into the woods far enough to stop the rain getting in. Or that a leaf had blown down to sit perfectly over the exhaust, saving me the cost of a re-build for which I would have to sell… something. No such luck. The exhaust was open to the air, inviting all interested precipitation to enter and travel down the manifold straight into the engine. I resolved to call Claude and get his advice. But I still worried. And I thought it would be outrageous for me to get my tractor doctor in to strip someone else’s engine, without that someone knowing anything about it. So I took half a dozen eggs round to Bernard’s house and confessed my stupidity. He took it very well, as it goes. He told me not to worry and said he’d come round the next day and have a look. Which was yesterday. I think I’ve learnt my lesson now. Let’s go back for a moment to 2006/7. Her Outdoors put a lot of work into finding the right kind of canvas for our yurts. She talked to lots of people (they weren’t always very forthcoming about their suppliers – not surprising as yurts were really taking off at the time and canvas was in increasingly short supply). She looked at lots of websites. And she settled on the unbleached 12-ounce ‘waterproof, rot-proof, flame-proof canvas’ everyone was using. Sounds very reasonable. I can’t see why anyone would do anything different. We ordered hundreds of metres (yards) of the stuff, from two different suppliers. Her Outdoors made a cover for our first 18-foot yurt, we put it in the trailer and off we went. If you’ve read this blog from the beginning (or the end, depending on which way you look at it), you may remember that August 2007 was very wet when we arrived in France. Very wet – outside and inside the yurt. So wet, we sought shelter in a house and Her Outdoors began to doubt her skills. Which are considerable (and award-winning). We put the original 18-foot up for extra storage. It leaked a bit less. And was a bit less mouldy. We put a new 18-foot up on a lovely dry beaten earth platform, with canvas from the second manufacturer. Just before a rainstorm. Which went straight through the cover, almost like it wasn’t there. Now, call me old-fashioned if you must, but if you sell something as ‘waterproof’ and ‘rot-proof’, it should be those things. The 12-foot cover rotted so badly, Her Outdoors had to make a new one before we could open this year. 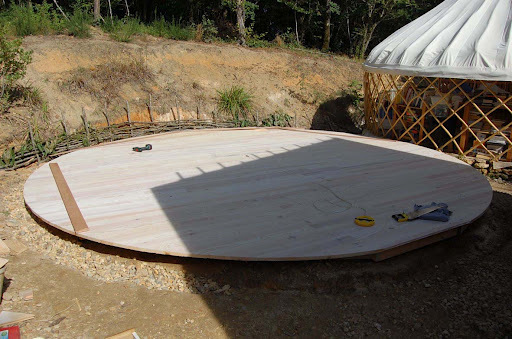 It lasted a few months (which would have cost 1250 GBP if made professionally – no wonder other yurt camps cost so much). Last week, it rained for the first time since July. Again, inside as well as outside our yurt (we re-proofed the guest yurt and Play Yurt at the start of the season and they held up pretty well. 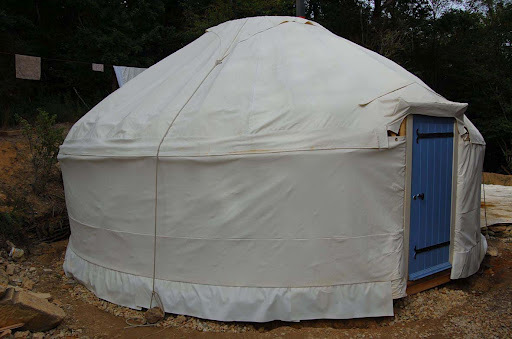 We couldn’t re-proof our yurt ‘cos the material was so new, the proofing ran off – yes, it’s actually proof-proof). We found how the water was coming in – and will be ordering some seam sealer in the next few days. o The return of a Big Machine. o A lunatic up a tree. Not necessarily in that order. But all (which will come as a relief to the hard of reading) with pictures.